Lommel An unknown soldier in the Polish Military cemetery in Lommel is after 74 years identified. Pilot Mikolaj Kirkilewicz was killed in action on 2 march 1945 in Cologne, but where his body was buried no one knew. Today was his Polish family finally answer. 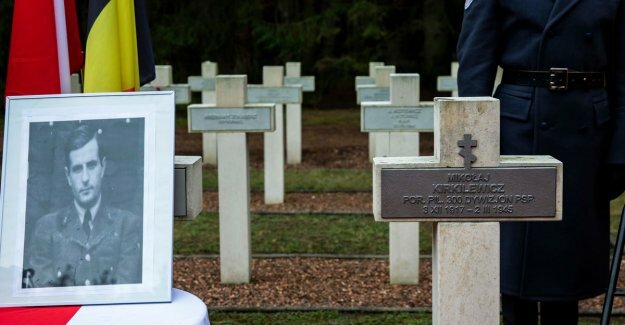 On december 2, 2017 found on the Polish Military Cemetery in Lommel is a excavation place of the bodies of two unknown soldiers. It was the first time that in our country, Polish soldiers from the Second world War were unearthed. The researchers hoped that they the family of the fallen soldiers had found. “The Polish embassy has us now know that there is a DNA match was found for one of the soldiers,” says mayor Bob de Nijs (CD&V). “It must be terrible for the family, for all those years. A photo on the mantelpiece, but don't know where the final resting place is. The before the WAR is over the years toned down, the cameras have moved on to other wars, but the pain for the relatives remained."